The backpack is unique designed of 3D cartoon characters, your baby will love the cute small backpack very much! It also has a leash preventing loss, you can totoally be relieved of your baby! Great for casual day use, preschool or day trip. 1.Large capacity: One main compartment for books, diapers or clothes; One small inner pocket for some small things lilke toys or small change. 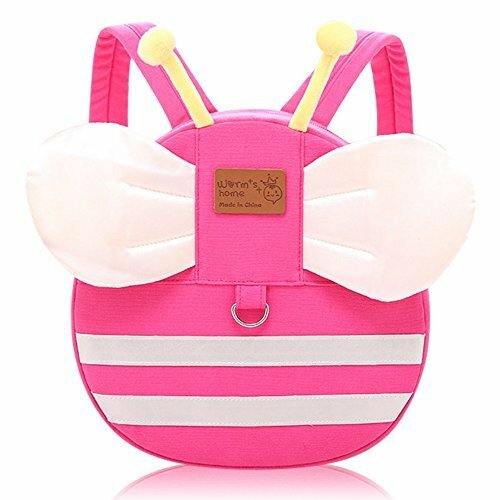 2.Adorable 3D cartoon characters design with cute wings which make the small backpack looks vivid and attractive. 4.There also has a safety leash, you can use it to hook a ring that on the top of the bag, the other side can be fixed on your hand. you can control the safety of your baby easily when she walks away from you. 5.Shoulder strap with a chest lock buckle, it can prevent the baby from falling off during the intense exercise. 100% brand new and high quality guranteed! So pls do not worry if there is any problem of it! Get your baby a prefect gift, great way to teach your children how to organize their own stuff and protect baby safely! Size:(L*W*H)25cmx7.4cmx26cm/9.84''x2.91''x10.21'', Recommended Age Range: 2-6 Years. Material: High quality soft durable canvas. Made with anti-lost safety harness leash for your baby. You can control the safety of your active young child while he/she walks away from you. Lovely cool 3D cartoon, designed with cute wings and tentacles, looks vivid and special, attract kids eyes. Shoulder strap with a chest lock buckle prevent the baby from falling down during the intense exercise. Adjustable Straps-The padded straps are easily adjustable to accommodate the height/girth of your young baby.